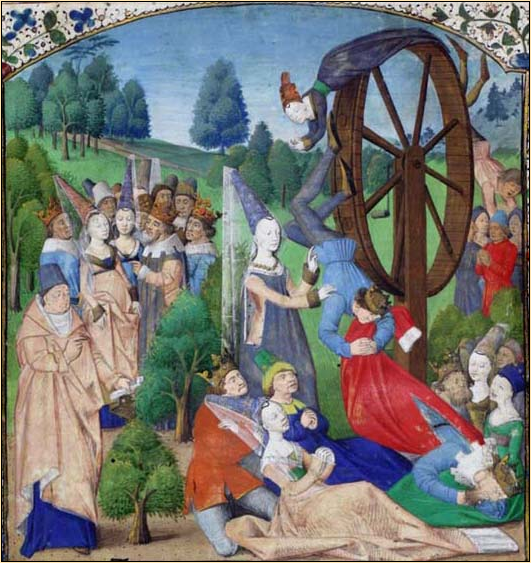 The flip side to De mulieribus claris / Praise of Good Women: Boccaccio, De casibus virorum illustrium / The Fall of Princes: Fortune and her wheel (1467: Laurence de Premierfait's 1409 French translation: University of Glasgow library, Sp. Coll. ms Hunter 371-72, vol. 1, f. 1r). Posted in 5. Folly, Uncategorized	| Enter your password to view comments. Posted in 5. Folly	| Enter your password to view comments.